IL-18 induces inflammation resulting in either enhanced protection from pathogens or exacerbation of autoimmunity, and T cells are profoundly activated during these responses. How IL-18 influences T cell activation is unknown, but this study in mice shows that IL-18 boosted Ag-specific T cell clonal expansion of effector T cells and induced a subpopulation of IFN-γ superproducing T cells. 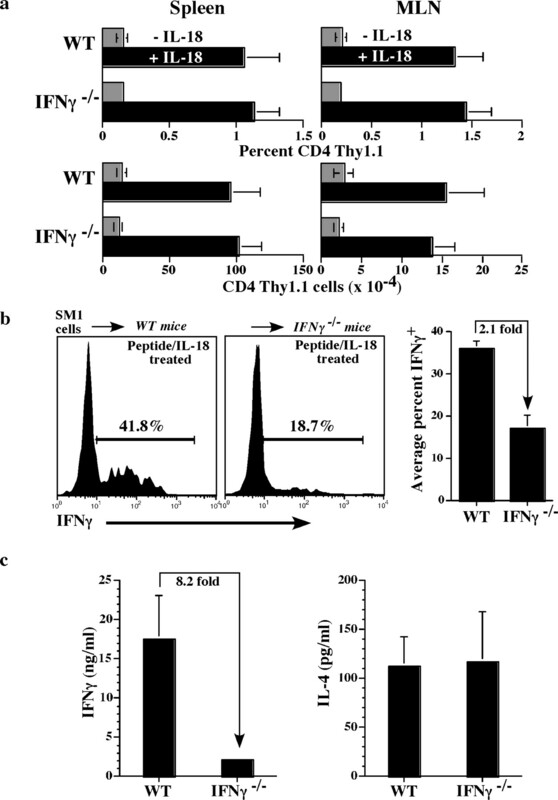 Commitment to IFN-γ production through IL-18 was independent of NK cells and IL-12 but dependent on host-derived IFN-γ. To determine how expansion of these effectors occurred, IL-18 was shown to induce OX40L on dendritic cells, whereas peptide stimulation induced CD134 (OX40) on specific T cells. CD134 blockade inhibited T cell effector expansion thereby reducing the number of IFN-γ superproducers by 12-fold. Thus, independent of IL-12, IL-18 impacts T cell immunity throughout lymphoid and nonlymphoid tissue by bridging the innate and adaptive arms of the immune system through IFN-γ and the CD134 costimulatory pathway. IL-18 is a multifunctional cytokine produced by macrophages and dendritic cells (DCs)4 (1, 2) with profound effects on the innate and adaptive immune systems (3, 4, 5). Activation by IL-18 through the IL-18R is supported by MyD88 (6) and IRAK-4 (7) adapter molecules, which ultimately stimulate NF-κB and NFAT transcriptional activity (8). A predominant feature of stimulation by IL-18 is IFN-γ synthesis (9). Many cells, such as NK cells (10), DCs (11), macrophages (12), and both CD4 (13) and CD8 (14, 15) T cells respond in this manner, although the presence of IL-12 is usually required for optimal IFN-γ secretion. Mice deficient in either IL-18 (16) or the IL-18R (17) show defective NK cell and Th1 responses in vivo, confirming the importance of IL-18 during inflammatory responses. Specifically, IL-18 has been shown to directly or indirectly induce TNF, IL-1, IL-8, IL-4, and IL-13 (18, 19, 20). Importantly, experimental models of sepsis (21), arthritis (22), and colitis (23) in mice are treatable by IL-18 blockade. Thus, IL-18 is a powerful inflammatory stimulant that can induce severe pathological damage, and it has been suggested that a better understanding of this process will fuel much-needed immunotherapeutic intervention (24). Conversely, IL-18 has potential as an efficacious adjuvant (25). Although IL-18 potently stimulates cells of the innate immune system, it also affects T cells. T cells from unstimulated mice do not respond to IL-18 because they lack the IL-18R; however, upon stimulation with IL-12, surface IL-18R appears, thereby conferring direct responsiveness to IL-18 (26, 27). Interestingly, IL-18 can act directly on effector and memory T cells by inducing migration (28), proliferation, and IFN-γ secretion even in the absence of recall Ag (13, 14, 15, 29). Likewise, studies demonstrate enhanced memory T cell responses after signaling through the IL-18R (30). Ultimately, IL-18 mediates protection against Salmonella and Shigella (31, 32), viral infections such as HIV and HSV (33, 34, 35), and in various tumor models (36, 37, 38, 39). These responses are largely T cell dependent, but a unifying mechanism linking IL-18, the innate, and adaptive immune systems is undefined. In this in vivo study, we show how IL-18 bestows its effects on adoptively transferred CD4 T cells. After immunization, IL-18 profoundly improved Ag-specific T cell clonal expansion of effector cells and recall potential of IFN-γ and IL-4 production. Specifically, we detected an IL-18-conditioned subpopulation of IFN-γ superproducing CD4 effector T cells. In targeting the mechanism of IL-18, we investigated commitment to IFN-γ production and expansion of these effector cells. IL-18 acted independently of NK cells and IL-12 to induce IFN-γ commitment; however, IFN-γ production by the host was required for commitment to IFN-γ, but not for effector cell expansion. To pursue the effector expansion mechanism, IL-18 was shown to induce OX40L on DCs, and peptide-stimulated T cells up-regulated CD134 (OX40). We found that CD134 blockade inhibited expansion of the effector cells. Thus, IL-18 bridges the innate and adaptive immune systems through induction of IFN-γ and the CD134 pathway. C57BL/6, IL-18R-deficient (IL-18R−/−), p35−/−, p40−/−, and IFN-γ−/− mice were purchased from either the National Cancer Institute (Frederick, MD) or The Jackson Laboratory. SM1 TCR transgenic mice (CD4+, Thy1.1+, RAG−/−) were bred by our laboratory, and all mice were housed in the animal facility at the University of Connecticut Health Center (Farmington, CT) under specific pathogen-free conditions according to National Institutes of Health guidelines. For the adoptive transfer studies, ∼5 × 105 bulk cells from the lymph nodes and spleen of SM1 TCR transgenic mice were injected i.v. on day −1. We found it unnecessary to purify CD4 T cells from the bulk population before transfer because this did not affect the outcome of the T cell response (data not shown). On day 0, 100 μg of flagellin peptide (40) (residues 427–441; Invitrogen Life Technologies), was injected i.p., and 30 min later, 5 μg of IL-18 (MBL International) was injected i.p. IL-18 injections (5 μg each) were given on the subsequent 2 days (days 1 and 2). For peptide alone-treated mice, balanced salt solution medium was injected in the place of IL-18. The 5-μg dose of IL-18 was based on titration studies, which showed that 5 μg yielded a maximal effect at the lowest dose (data not shown). Protein G (Invitrogen Life Technologies) purified agonistic mAb specific to CD134 (41) was injected at 50 μg immediately after flagellin peptide. The anti-OX40L blocking mAb was injected on days 0, 1 and 2 before each IL-18 injection at a dose of 100 to 400 μg. This mAb was purified from RM134L hybridoma supernatant (42) and purified over a protein G column. Rat IgG (Sigma-Aldrich) was injected as a control for both of the above mentioned mAbs. All mAbs were diluted into PBS for injection. Spleens, peripheral lymph nodes (PLNs) (inguinal, axillary, or brachial) and mesenteric LNs (MLNs) were crushed through nylon mesh cell strainers (Falcon/BD Biosciences), and spleens were treated with ammonium chloride to lyse RBC. In Fig. 1⇓e, the tissues were digested with collagenase D (Roche) for 30 min at 37°C before passing through the cell strainers. Liver and lung lymphocytes were obtained as described (43). For isolation of liver lymphocytes, perfused livers were crushed through cell strainers, and the cells partitioned on a 35% Percoll (Sigma-Aldrich) gradient. Perfused lungs were cut into pieces and incubated at 37°C in 1.3 mM EDTA for 30 min and then collagenase (Invitrogen Life Technologies) for 1 h. Low-density lymphocytes were obtained from the interface lying between 44 and 67% Percoll (Amersham Biosciences). IL-18 enhances clonal expansion and effector function of peptide-stimulated CD4 T cells. a, Bulk SM1 spleen and LN cells were transferred into C57BL/6 mice (day −1). On day 0, flagellin peptide was injected. IL-18 was injected on days 0, 1, or 2; on all three days (0, 1, 2); or not at all (None). On day 5, spleens were removed, and the average percentages (left graph) and numbers (right graph) ± SEM were determined. Data are pooled results from two separate experiments, with a total of six mice per group, but are representative of more than three similar experiments. b–d, SM1 cells were transferred into C57BL/6 mice on day −1 and stimulated with flagellin peptide on day 0. Mice were further treated without IL-18 (▦) or with IL-18 on days 0, 1, and 2 (▪). b, On day 5, bulk splenocytes from each group were restimulated in vitro with flagellin peptide, and 24 or 48 h later, IFN-γ levels were determined by ELISA. Bars show average IFN-γ (ng/ml) ± SEM from nine wells pooled from triplicate cultures from three separate mice. c, Day 5 splenocytes were restimulated for 5 h in vitro and then stained for intracellular IFN-γ. Representative autoscaled histograms of Thy1.1-gated cells are shown from each treatment group. A control IgG analysis region for each mouse was set to ∼0.5% to determine the percentage of IFN-γ producers. The superproducer analysis region was determined by setting the percent of Thy1.1 cells to ∼2% in the peptide alone group and applying this region to all samples. Data in the table show the percentage ± SEM of total IFN-γ producer or superproducer Thy1.1+ cells from three mice per group from one experiment but are representative of more than three similar experiments. d, Splenocytes taken from mice treated 5 days earlier with peptide ± IL-18 were restimulated with peptide in vitro, and the resulting [3H]thymidine incorporation was measured. Each point is the average cpm ± SEM from nine wells pooled from triplicate wells from each of three mice per group. Data are representative of more than three similar experiments. e, SM1 cells were transferred into C57BL/6 mice (day −1) and stimulated with flagellin peptide on day 0. Mice were further treated with (▪) or without (▦) one shot of IL-18 on day 0. Forty-eight hours after peptide injection, PLN and MLN tissues were collagenase treated, and the recovered cells were labeled with CFSE. Bulk cells (1 × 106) were cultured in vitro without restimulation. After 36 h in vitro, CD4 Thy1.1+ cells were gated and analyzed for survival by CFSE dilution and cell counts. Histograms overlayed on the same scale show representative CFSE profiles from each treatment group. Graphs (inset) show the percentage of Thy1.1 SM1 CD4 T cells at the beginning and after 36 h of culture. Data are representative of three experiments. DCs and macrophages were enriched as described (44). Briefly, LN or spleen tissues were digested with collagenase D (Roche) for 30 min at 37°C. After passing through a cell strainer and washing, enriched DC populations were obtained from the low-density fraction on a BSA gradient. In vitro restimulation of isolated cells was performed in three ways. Proliferation assays were set up by culturing 3-fold dilutions of whole spleen cells in 200 μl of complete tumor medium (CTM). CTM consists of MEM with FBS, amino acids, salts, and antibiotics. The cells were cultured with or without flagellin peptide (5 μg/ml). After ∼72 h, 1 μCi of [3H]thymidine (PerkinElmer) was added for the last 8 h of culture. Incorporation of 3H was analyzed with a Harvester 96 (Tomtec) and a 1450 Microbeta Trilux scintillation counter (PerkinElmer). For ELISA cultures, a total of 2 × 106 splenocytes was cultured in 200 μl of CTM with or without flagellin peptide (5 μg/ml). After 24 or 48 h, the supernatants were analyzed with IFN-γ or IL-4 ELISA kits from BD Biosciences. Intracellular cytokine cultures were set up by culturing 1 × 106 bulk spleen cells in 200 μl of CTM without any prior cell purification or fractionation. Flagellin peptide was added to some of the wells, while brefeldin A (Calbiochem) was added to all wells, both at a concentration of 5 μg/ml. Cultures were left for 5 h at 37°C before staining. The following mAbs were purchased from eBioscience: FITC-conjugated anti-CD44, anti-F4/80, anti-IFN-γ and control rat IgG1, allophycocyanin-conjugated anti-Thy1.1 and streptavidin, and biotinylated anti-OX40L (rat IgG2b control). The following mAbs were purchased from BD Biosciences: FITC-conjugated anti-Thy1.1, PE-conjugated CD45R, anti-CD80 (hamster IgG2 control), anti-CD86 (rat IgG2a control) and streptavidin, PerCP-conjugated anti-CD4, and biotinylated anti-CD134 (rat IgG1 control). Surface and intracellular staining was performed as described previously (45). Briefly, nonspecific binding was blocked by a solution containing mouse serum, human IgG, and the anti-Fc mAb 2.4G2 (46). Staining buffer consisted of balanced salt solution, 3% FBS, and 0.1% sodium azide. For intracellular staining, surface staining was performed first, followed by fixation with 2% formaldehyde, permeabilization with 0.25% saponin, and then incubation at room temperature with the anti-cytokine mAb. All flow cytometry was conducted on a BD FACSCalibur flow cytometer and the data analyzed using CellQuest (BD Biosciences) or FlowJo software (Tree Star). SM1 TCR transgenic T cells were transferred into C57BL/6 mice. Six hours later, anti-NK1.1 mAb clone PK136 (47) ascites fluid or mouse IgG was injected. Two days after injection, the depletion was verified by staining blood samples with anti-CD94-FITC and anti-CD49b (DX5)-PE (eBioscience). Flagellin peptide and IL-18 were injected as described above, and T cell responses were measured on day 5. To understand the basis of IL-18 adjuvanticity, our initial studies sought to examine what effect administration of exogenous IL-18 would have on developing T cell responses in vivo. SM1 TCR transgenic mice produce Thy1.1 CD4 T cells specific to a Salmonella flagellin peptide (48). A total of 5 × 105 bulk SM1 spleen and LN cells were transferred into Thy1.2 C57BL/6 mice (day −1) and the following day (day 0) immunized with 100 μg of flagellin peptide. As shown in Fig. 1⇑a, 5 days after peptide injection without IL-18 (None), an increase in specific T cells in the spleen was observed, compared with no peptide (∼0.05% CD4 Thy1.1; data not shown). Injection of IL-18 on days 0, 1, and 2 led to a 7.5-fold increase in the percent of splenic CD4 Thy1.1 cells, compared with peptide alone, as well as an 8.5-fold increase based on numbers (Fig. 1⇑a, right panel). The majority of this effect was attributable to the day 0 injection which yielded a large but smaller increase in clonal expansion, compared with the triple injection. After peptide injection, administration of IL-18 on days 1 or 2 induced much less expansion based on percentages and numbers (Fig. 1⇑a). To expand this observation, we tested the effects of IL-18 in a superantigen model and demonstrated that IL-18 boosted not only superantigen-specific CD4 T cells, but also CD8 T cells (data not shown). We next examined whether IL-18 could improve CD4 T cell effector cytokine production. Bulk SM1 spleen and LN cells were transferred into C57BL/6 mice (day −1), stimulated with peptide on day 0 and given IL-18 (days 0, 1, and 2) or not. On day 5, splenocytes were isolated from each group and restimulated in vitro with flagellin peptide for 24 h. IFN-γ in supernatants was measured by ELISA and the data showed a 33-fold increase of IFN-γ by cells taken from mice treated with peptide/IL-18, compared with cells taken from peptide-alone mice (Fig. 1⇑b). Even supernatants from 48 h showed a 7-fold increase in IFN-γ levels, and the same trend also was observed in a superantigen model (data not shown). Because ELISA data does not measure specific cell cytokine production, we used intracellular cytokine staining to test whether Ag-specific CD4 T cells from peptide/IL-18-treated mice synthesized more IFN-γ than those from peptide alone-treated mice. In vitro peptide restimulation of day 5 splenocytes revealed that ∼50% of Thy1.1+ cells from peptide/IL-18-treated mice made IFN-γ, whereas only 22% were IFN-γ+ from peptide alone-treated mice (Fig. 1⇑c). Based on mean fluorescence intensity analysis, we also observed that IL-18-treated cells produced greater quantities of IFN-γ. To examine this subpopulation of super producers, an analysis region was set on peptide alone-treated Thy1.1+ cells at ∼2% of the top IFN-γ producing cells. This exact region was then applied to all treatment groups. As shown in the table, there was a >5.5-fold increase of IFN-γ superproducers in the peptide/IL-18 group, compared with the peptide alone group. Thus, in vivo injection of IL-18 substantially boosts IFN-γ production by CD4 effector T cells responding to recall Ag. Although cytokine production was enhanced, [3H]thymidine incorporation was comparable between IL-18-treated or untreated groups. Based on total cells in culture, peptide/IL-18-treated cells proliferated better than peptide alone cells upon restimulation (Fig. 1⇑d); however, if normalized for actual numbers of CD4 Thy1.1 cells in culture, both groups proliferated comparably (data not shown). Lastly, we tested if IL-18 adjuvanticity intrinsically conditioned Ag-specific T cells to survive. Bulk SM1 spleen and LN cells were transferred into C57BL/6 mice, and the next day (day 0) stimulated with peptide with or without IL-18. On day 2, the PLN and MLN were collagenase digested to improve recovery of Ag-specific T cells (45), and the cells labeled with CFSE and cultured in vitro without any restimulation. Before culture, the percentage of CD4 Thy1.1 cells was comparable between both groups (Fig. 1⇑e, see inset graphs), but by 36 h, very few viable specific cells from the peptide-alone group were detected in culture. This is in contrast to Thy1.1 SM1 T cells taken from the peptide/IL-18-treated mice, which survived extremely well and actually increased in number due in part to proliferation coupled with survival (Fig. 1⇑e, inset). After 36 h, CFSE dilution by the Thy1.1+ cells taken from the peptide/IL-18-treated mice was initiating in PLN cultures, whereas in MLN cultures, nearly every cell had gone through at least one round of division (Fig. 1⇑e). Thy1.1+ cells from the peptide-alone mice did not survive culture as indicated by the decrease of CFSE-labeled cells. Taken together, these data show that exposing Ag-stimulated CD4 T cells to IL-18 enhances clonal expansion, effector function, and at least short-term survival. Numerous reports show that NK cells respond to IL-18 by proliferating and secreting cytokines (10, 16, 49). To study the role of NK cells in this system, we transferred bulk SM1 spleen and LN cells into C57BL/6 mice, and 6 h later, injected anti-NK1.1 mAb ascites. Depletion was confirmed 2 days later by staining blood cells with anti-DX5 and CD94 mAbs (Fig. 2⇓a, day 0). Very few double-positive cells were present, although they were readily detected in control IgG-treated mice. All mice were injected with peptide, with or without IL-18, and on day 5, NK cells in the spleen and other tissues were still absent (Fig. 2⇓a, day 5). Importantly, Thy1.1+ SM1 CD4 T cells expanded in response to IL-18 in the absence of NK cells (Fig. 2⇓b). Compared with peptide treatment alone, IL-18 boosted CD4 Thy1.1 percentages 13-fold in the spleen, 10-fold in the MLN, and 9-fold in the PLN, whereas numbers increased by 14.5-, 8.5-, and 23-fold, respectively. SM1 T cells efficiently produced IFN-γ, because 2.5-fold more made IFN-γ, compared with cells from peptide alone-treated mice (Fig. 2⇓c). Taken together, these data show that IL-18 boosts T cell immunity in a NK cell-independent manner. NK cells are not required for the adjuvant effect of IL-18. Six hours after adoptive transfer of SM1 cells, NK cells were depleted from C57BL/6 host mice by injection of PK136 ascites (∼200 μg of mAb). a, Two days later, CD94+ and DX5+ blood cells were analyzed (day 0). After depletion, on day 0, mice were injected with flagellin peptide ± IL-18, and residual NK populations in the spleen on day 5 are shown. b, Bar graphs show the day 5 average percentage and number ± SEM from five mice per group of SM1 cells from NK-depleted mice treated with (▪) or without (▦) IL-18. c, Day 5 splenocytes taken from mice treated with peptide alone (gray histogram) or peptide/IL-18 (black histogram) were restimulated in vitro to measure intracellular IFN-γ synthesis. Representative autoscaled histograms of gated Thy1.1 cells are shown. The positioning of the analysis line is set against a negative control IgG stain. Percentages represent the average IFN-γ production ± SEM from five mice per group. All data are from one of two similar experiments. Another possibility was that T cells were directly responding to IL-18 regardless of whether the APCs could respond to IL-18. Bulk SM1 spleen and LN cells were transferred into C57BL/6 or IL-18R−/− mice and stimulated with peptide alone or peptide/IL-18 (Fig. 3⇓a). SM1 T cells exposed to peptide alone reached peak expansion on day 4 and began to decline thereafter (Fig. 3⇓b). In C57BL/6 recipients, IL-18 enhanced clonal expansion in all tissues examined. By day 4, the percentage (upper panels) of CD4 Thy1.1 cells increased by 4-fold in the spleen and MLN, and by 3-fold in the PLN and blood, compared with mice treated with peptide alone. Based on numbers (lower panels), CD4 Thy1.1 cells in the spleen and PLN increased by ∼6.5-fold, whereas those in the MLN increased by ∼2.5-fold. By day 6, contraction and/or migration out of the PLN and blood was becoming apparent. IL-18 initiates Ag-specific T cell clonal expansion indirectly. a, Bulk SM1 cells were adoptively transferred into C57BL/6 or IL-18R−/− mice. Recipients were given flagellin peptide with (▪) or without (▦) IL-18. b, After peptide injection, T cells from the spleen, MLN, PLN, and blood were analyzed. Line graphs show the percentages and numbers ± SEM of SM1 cells in each tissue, with at least three mice per group. Bar graphs (lower right) show the numbers ± SEM of SM1 cells in the MLN and PLN of IL-18-treated mice 10 days after peptide injection. IL-18 had no effect in IL-18R−/− mice even though the specific Thy1.1 SM1 CD4 T cells were IL-18R sufficient. This trend persisted to day 10 where very few SM1 cells were detected in IL-18R−/− recipients but were still present in C57BL/6 recipients (Fig. 3⇑b: bar graph at lower right, compare upper with lower bars). In accordance with the lack of expansion, the SM1 cells in IL18R−/− recipients made small amounts of IFN-γ after IL-18 treatment as determined by ELISA and intracellular cytokine staining (data not shown). Nevertheless, SM1 cells in IL-18R−/− recipients responded to peptide alone similar to SM1 cells in C57BL/6 mice, suggesting that there is no defect in basal activation or Ag presentation. 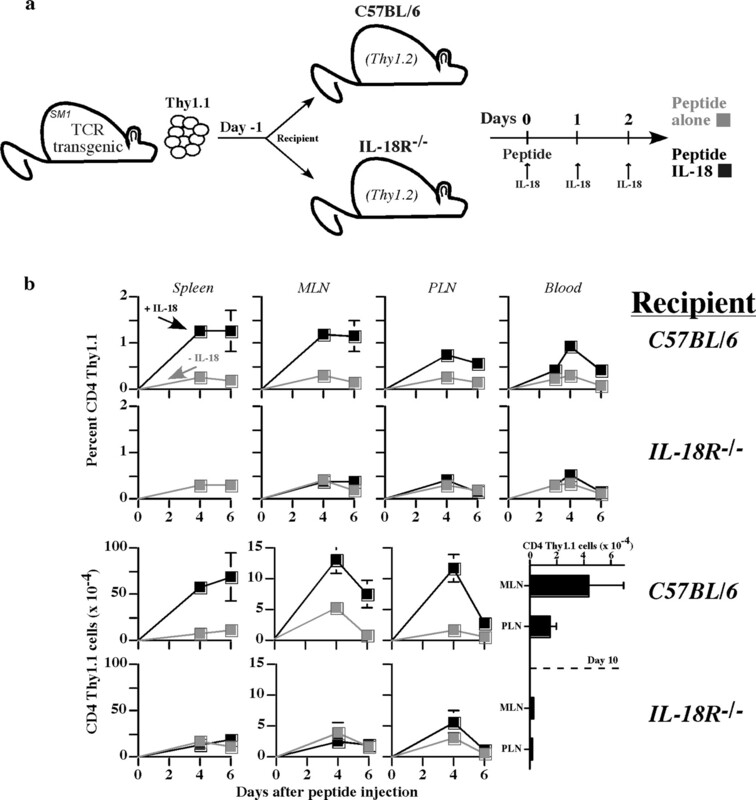 These data show that IL-18R must be on the host to initiate the T cell response, but it does not preclude IL-18 binding to the T cell later in the response. Many reports have demonstrated induction of IL-18R on T cells by IL-12, and thus IL-18 and IL-12 are often thought to work in synergy (14, 15, 26, 27). We tested whether the IL-18 effects were dependent on IL-12 by transferring SM1 cells into p35−/− and p40−/− mice (Fig. 4⇓). Compared with peptide alone, injection of peptide/IL-18 boosted clonal expansion of SM1 T cells comparably in the PLN and spleen of wild-type (WT), p35−/−, or p40−/− mice. For example, peptide/IL-18 enhanced the percentage of SM1 T cells in the spleen 8- to 12-fold and the number 10- to 15-fold (Fig. 4⇓a). In vitro restimulation of spleen cells taken from primed WT or knockout mice showed no significant differences in IFN-γ production, as measured by total IFN-γ producers or superproducers (Fig. 4⇓b). Furthermore, ELISAs performed on supernatants taken from peptide-restimulated cultures found that IL-18 also enhanced IL-4 production from cells taken from WT mice and that this was not altered in either of the knockout mice (Fig. 4⇓c). A second direct test of IL-18 bypassing an IL-12 requirement was examined by stimulating endogenous T cells in p35−/− mice with superantigen plus IL-18 or no IL-18, and the data showed enhanced expansion and a substantial increase in IFN-γ synthesis in the IL-18 group but not in the superantigen alone group (data not shown). IL-18 does not require IL-12 for IFN-γ commitment. 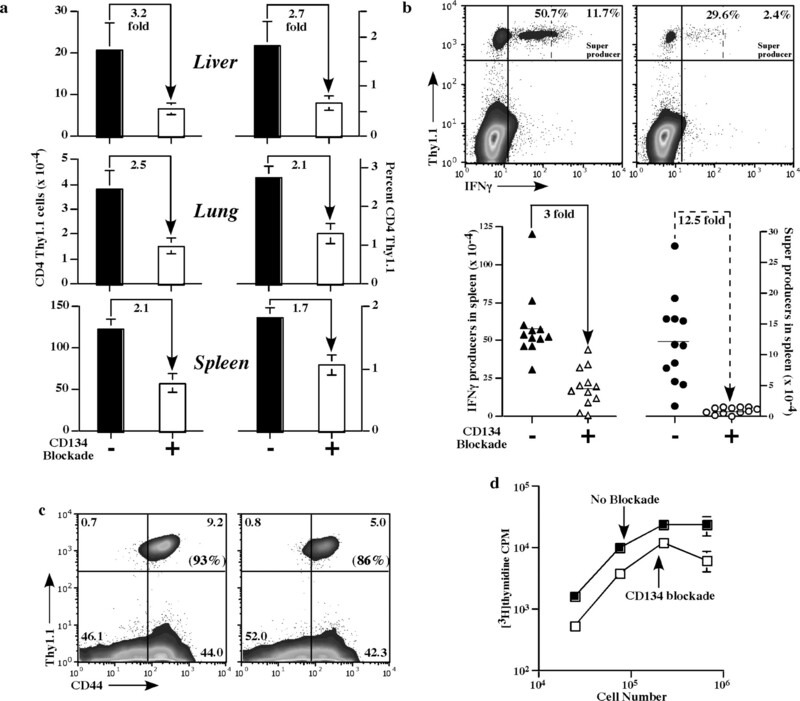 Bulk SM1 cells pooled from LNs and spleen were transferred into C57BL/6 (WT), p35−/−, or p40−/− mice. The next day, mice were treated with peptide alone (▦) or peptide/IL-18 (▪). a, Five days after peptide injection, T cells from the LNs and spleen were enumerated. Data show the percentages and numbers ± SEM pooled from three or four separate experiments, and each bar contains either 5–10 mice (peptide alone) or 7–12 mice (peptide/IL-18). b, From each treated mouse, bulk splenocytes without any fractionation were restimulated in vitro for 5 h with flagellin peptide, and intracellular IFN-γ synthesis was analyzed. The total percentage of IFN-γ producers (▪) was determined as described in the legend for Fig. 1⇑. The percentage of superproducers (▩) was determined by setting the WT percentage to ∼7% and using the same region to analyze all mice. Bars represent peptide/IL-18-treated mice only and are average values ± SEM from three or four experiments with 7–12 mice per group. c, Splenocytes were restimulated in vitro with flagellin peptide for 48 h, and the resulting supernatants were analyzed for the presence of IL-4 by ELISA. Each data point represents the concentration of IL-4 in pg/ml from individual wells of triplicate cultures set up from 5 to 12 mice over three or four separate experiments. Knowing that IL-12 was not required for the adjuvant effect, we next studied IFN-γ, as this is a key mediator of IL-18 effects. To examine a role for IFN-γ, bulk SM1 cells were transferred into either WT or IFN-γ−/− mice and stimulated with peptide and IL-18 as before. 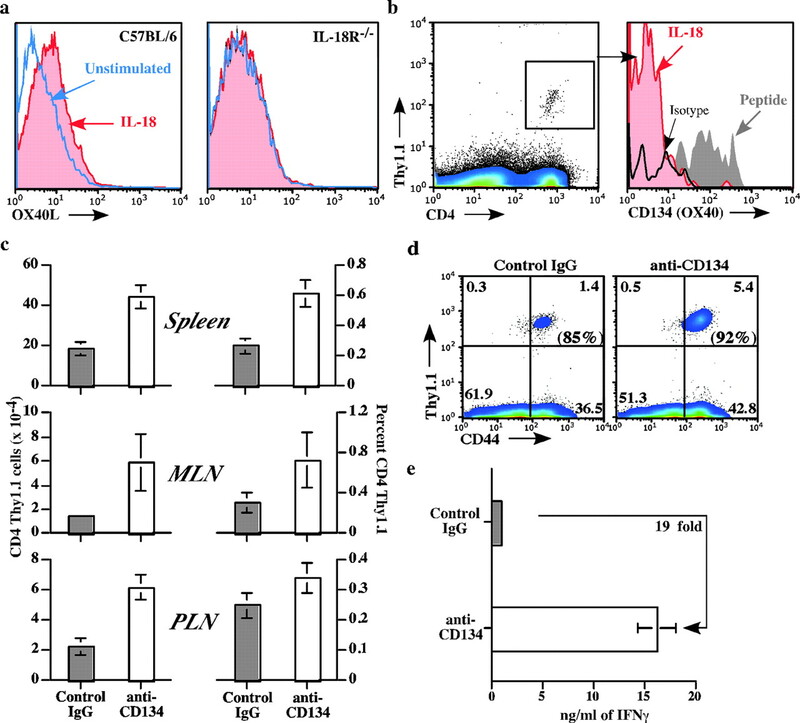 Clonal expansion of the SM1 T cells was unaffected by the absence of IFN-γ, with 7- to 8-fold boosts in T cell accumulation in the spleen and MLN by day 5 (Fig. 5a⇓). In contrast, there was a profound reduction of IFN-γ producers after recall in the SM1 population taken from IFN-γ−/− mice, compared with those removed from WT mice (Fig. 5⇓, b and c). This was the case as measured by intracellular cytokine staining (2-fold less IFN-γ after 5 h of restimulation), or by ELISA (8-fold less IFN-γ after 24 h in culture). Importantly, recall IL-4 production was unaffected, which speaks to the idea that there continued to be production of effectors, just very few committed to IFN-γ (Fig. 5⇓c). IFN-γ is important for effector IFN-γ production but not expansion. Bulk SM1 cells were injected into C57BL/6 (WT) or IFN-γ−/− mice. The next day, mice were treated with peptide alone (▦) or peptide/IL-18 (▪). a, Clonal expansion on day 5 in the spleen and MLN is shown as the percentage or number ± SEM. Data are pooled from four separate experiments and contain 6–13 mice per group. b, Bulk splenocytes from day 5 peptide/IL-18-treated mice were restimulated with peptide in vitro for 5 h, and intracellular IFN-γ was analyzed. Histograms show representative plots of IFN-γ staining from Thy1.1-gated SM1 cells. The bar graph (right) shows the mean percentage ± SEM of IFN-γ producing SM1 cells pooled from three separate experiments, with a total of 11 mice per group. c, Day 5 bulk splenocytes taken from peptide/IL-18-treated mice were restimulated with peptide in vitro for 24 h, and the accumulation of IFN-γ or IL-4 in the culture supernatants was measured by ELISA. Bars show the mean ± SEM concentration of each cytokine in culture from one of two separate experiments and contain 10 measurements each. Because NK cells and IL-12 were not required for adjuvanticity, but IL-18R was, we reasoned that DCs were central. DCs likely present peptide to the Ag-specific SM1 T cells and thus may be properly positioned to influence T cell activation in response to IL-18. To examine this possibility in vivo, bulk SM1 spleen and LN cells were transferred into C57BL/6 mice and treated with nothing, IL-18, peptide, or peptide/IL-18. After 18 h, DC-enriched LN cells were stained with a panel of mAbs recognizing activation/costimulatory molecules. In response to IL-18 alone, CD11c+ DCs increased CD80, CD86, CD40, CD54, and MHC class II expression (data not shown). However, we also observed OX40L induction in response to IL-18 alone (Fig. 6⇓a), a finding that is consistent with our initial data showing that stimulation of purified bone marrow-derived DCs with IL-18 directly induced OX40L (data not shown). Further, induction of OX40L was dependent on the DCs expressing IL-18R, because no increase of OX40L expression was observed on IL-18R−/− DCs. Nevertheless, macrophages, but not T or B cells, also increased OX40L expression in response to IL-18 (data not shown). IL-18 induces OX40L expression on DCs that can boost T cell responses. a, C57BL/6 (left plot) or IL-18R−/− (right plot) mice adoptively transferred with SM1 cells were injected with medium alone (blue line) or IL-18 (red histogram). After 18 h, pooled PLN and MLN cells were enriched for DCs, and CD11c+ cells were gated to examine OX40L expression. Data from C57BL/6 mice are representative of 12 separate experiments, whereas the data from IL-18R−/− mice are from one of four similar experiments. In both plots, isotype control mAbs stained at background levels. b, SM1 cells transferred into C57BL/6 mice were stimulated with IL-18 or peptide alone. After 18 h, pooled PLN and MLN tissues were collagenase treated, and T cells were stained for expression of CD134. The left plot shows the CD4 Thy1.1 gate, and the right plot overlays CD134 expression by gated cells taken from IL-18-treated (red) or peptide-treated (gray) mice and an isotype control stain on cells from peptide-treated mice (black). c–e, SM1 cells were transferred into IL-18R−/− mice and the next day stimulated with flagellin peptide and an agonistic anti-CD134 mAb (□) or control IgG (▦). c, Five days after peptide injection, the lymphoid tissues were removed from each mouse, and the percentage and number ± SEM of SM1 cells were determined. Bars represent pooled and averaged data from three separate experiments, with at least seven mice per group. Data from C57BL/6 control mice were comparable (data not shown). d, Day 5 cells from anti-CD134 or control IgG-treated mice were gated on CD4, and CD44 expression by Ag-specific Thy1.1 cells was determined. The number in parentheses represents the percentage of Thy1.1 cells that are CD44high. e, Day 5 bulk splenocytes were restimulated with flagellin peptide for 24 h and assayed for IFN-γ production by ELISA. Data show IFN-γ concentrations ± SEM pooled from triplicate cultures and averaged from at least three mice from one of two similar experiments. Next, it was determined whether the receptor for OX40L, CD134, was expressed by the Thy1.1 SM1 CD4 T cells in our system. After 18 h of in vivo peptide stimulation, we detected high levels of CD134 on gated peptide-specific CD4 Thy1.1 LN cells (Fig. 6⇑b). Induction was completely dependent upon peptide injection, because CD134 was not observed on SM1 T cells with IL-18 alone (Fig. 6⇑b), nor did IL-18 enhance CD134 expression on peptide-stimulated T cells (data not shown). Thus, IL-18 increased the expression of OX40L on DCs and peptide stimulation-induced CD134 on the specific T cells. Based on this data, we hypothesized that the CD134 costimulatory pathway may be important for the adjuvant effect induced by IL-18. Because SM1 T cells expressed CD134 after peptide treatment, we tested whether stimulation of CD134 with an agonistic mAb would restore SM1 T cell expansion and effector function in IL-18R−/− host mice. SM1 cells were transferred into IL-18R−/− mice, and the next day stimulated with peptide and anti-CD134 agonist mAb. Five days later, the numbers of Thy1.1 SM1 CD4 T cells increased by 2.4-fold in the spleen, 3.9-fold in the MLN, and 2.8-fold in the PLN, compared with mice treated with control IgG, and similar data were obtained by analyzing percentages (Fig. 6⇑c). This was the case, even though both treatments induced comparable levels of CD44high SM1 T cells (Fig. 6⇑d), which were at least 3-fold higher than in untreated mice (data not shown). Additionally, IFN-γ was secreted in large quantities after in vitro restimulation of populations that were costimulated through CD134 (Fig. 6⇑e). These results are comparable with those observed in C57BL/6 mice (data not shown). Other costimulators, such as anti-CD137 (4-1BB) and anti-CD40 agonistic mAbs, had little effect in boosting SM1 T cell clonal expansion and IFN-γ production, compared with the anti-CD134 mAb (data not shown). Furthermore, dual injection of IL-18 and anti-CD134 mAb did not synergize to boost T cell responses (data not shown) like we have previously observed with LPS and anti-CD134 (50). To fully test whether CD134 played a dominant in vivo role in this system, we blocked OX40L. SM1 cells were transferred into C57BL/6 mice and stimulated with peptide/IL-18 in the presence of a nondepleting antagonistic anti-OX40L mAb (CD134 Blockade) (42, 51, 52) or with a control IgG. On day 5, analysis of peripheral and lymphoid tissues showed that the CD4 Thy1.1 populations expanded in the liver, lung, and spleen in response to peptide/IL-18, reaching ∼2% or higher in each tissue (Fig. 7⇓a). However, CD134 blockade inhibited accumulation of CD4 Thy1.1 T cells in these tissues. The greatest inhibition was in liver and lung where 2.5- to 3-fold decreases were observed, while T cell expansion also was inhibited by ∼2-fold in the spleen. Interestingly, expansion was not inhibited in the PLN (data not shown), suggesting that the CD134 pathway may exert itself most effectively in peripheral tissues where the largest effector populations are detected (43, 53). IL-18 adjuvanticity depends on CD134 costimulation. Bulk SM1 cells were transferred into C57BL/6 mice and stimulated with flagellin peptide and three injections of IL-18 as shown in Fig. 3⇑a. Before each injection of IL-18, antagonistic anti-OX40L mAb was injected to block CD134 ligation (□), or a control IgG was injected for no blockade (▪). a, On day 5, lymphoid and peripheral tissues were analyzed for T cell clonal expansion. Percentages and numbers ± SEM of SM1 cells from the liver, lung, and spleen are shown. Arrows represent the fold decrease observed upon CD134 blockade, compared with control. Data are pooled and averaged from three separate experiments and contain 12 mice per group. b, Day 5 splenocytes recovered from control (left panel) or CD134 blockade-treated (right panel) mice were restimulated in vitro and analyzed for intracellular IFN-γ production. The central number represents the percentage of IFN-γ producers in the Thy1.1 SM1 population (determined by setting a control IgG stain to ∼0.5%). The number to the right of the dotted line represents the percentage of IFN-γ superproducers within the Thy1.1 population. This was determined by setting the CD134 blockade group to ∼2% and keeping the same gate for all mice. Percentages listed in the plots are representative of the average percentages of all 12 mice. In the lower panels, individual numbers of splenic IFN-γ producers or superproducers from all 12 mice are shown in scatter plots with average values denoted by thin lines. c, CD4-gated cells from each treatment group were analyzed for CD44 expression by Ag-specific Thy1.1 SM1 cells. Number in parentheses denotes the percentage of Thy1.1 CD44high cells in the control (left panel) or with CD134 blockade (right panel). d, Splenocytes from each treatment group were restimulated with peptide in vitro and [3H]thymidine incorporation was measured. Data show the cpm from 12 wells pooled from triplicate cultures from four separate mice and are representative of one of three experiments. CD134 blockade reduced IFN-γ production (Fig. 7⇑b) because the percentage of Thy1.1 cells making IFN-γ was 47.0 ± 2.0% in control mice but dropped to 31.7 ± 2.5% in CD134 blockade mice (Fig. 7⇑b, top panels). The total number of IFN-γ producers in the spleen decreased from 58.5 ± 6.6 × 10−4 in the control to 19.4 ± 3.9 × 10−4 in the CD134 blockade group, while the total number of IFN-γ superproducers was dramatically reduced from 12.2 ± 2.1 × 10−4 to 1.0 ± 0.2 × 10−4, a >12-fold decrease. These data were also confirmed by ELISA and are consistent with data obtained from liver (data not shown). IL-4 production also was substantially reduced in culture supernatants from the CD134 blockade group, suggesting that the reduction in IFN-γ did not skew toward a Th2 response (data not shown). Nevertheless, CD134 blockade did not prevent increases in CD44 levels confirming that the specific T cells were stimulated (Fig. 7⇑c). Also, in vitro recall with flagellin peptide induced similar levels of [3H]thymidine incorporation, further confirming specific stimulation (Fig. 7⇑d). Lastly, analysis of DC surface phenotype after peptide/IL-18 and CD134 blockade showed similar induction of CD80 and CD86, compared with control mice (Fig. 8⇓). These data suggest that, when CD134 is blocked, these costimulators cannot make up the difference. Nevertheless it is possible that other costimulators may contribute. CD134 blockade does not affect the activation phenotype of DCs. a, C57BL/6 mice were transferred with SM1 cells, and the next day treated with peptide/IL-18 in the presence (CD134 blockade) or absence (control IgG) of an antagonistic anti-OX40L mAb. Two days later, PLNs from treated mice were removed, and DCs were enriched on a BSA gradient and stained for CD80 and CD86. Histograms compare staining of control IgG (red) and CD134 blockade (gray) groups to DCs taken from naive mice (blue line) and are representative of one of two separate experiments. b, Average mean fluorescence intensities (MFI) ± SEM of CD80 and CD86 on DCs are pooled from four mice from two separate experiments. Previous reports show that IL-18 is a powerful adjuvant (9, 24, 25, 30). Although its adjuvant effects influence T cell responses, little is known about the underlying mechanism. We clarify this issue by showing that Ag and IL-18 treatment mediates Ag-induced clonal expansion of CD4 effector T cells with the appearance of a subpopulation that produces large amounts of IFN-γ. It is demonstrated that IL-18 induces IFN-γ commitment through IFN-γ and expansion of these effector cells is triggered by CD134 costimulation. Thus, IL-18 bridges innate and adaptive immunity through the CD134 pathway. As an adjuvant, IL-18 has been incorporated into DNA vaccines to improve antitumor and antiviral responses (35, 39, 54, 55). DCs and fibroblasts transfected with IL-18 become effective tumor vaccines (36, 38). Even injection of rIL-18 alone can combat fungal (56), bacterial (31, 32), and viral infections (34, 57). Importantly, in all of these studies, IL-18 enhanced Th1 or CTL responses in vivo. Our data complement these observations by explaining how protective T cell responses develop after IL-18 administration. IL-18 induces massive accumulation of Ag-specific effector CD4 T cells by enhancing clonal expansion and facilitating at least short-term survival (Fig. 1⇑). Furthermore, these cells disperse into lymphoid and peripheral tissues and become robust producers of IFN-γ. In fact, a super IFN-γ producing subpopulation was detected after IL-18 stimulation. In addition to CD4 T cells, we have found that specific CD8 T cells also clonally expand much better when exposed to IL-18 (data not shown). Interestingly, IL-18 directly induces division and cytokine secretion by effector or memory T cells in the absence of recall Ag (29, 58). However, naive T cells do not express the IL-18R (27), and therefore it was surprising that IL-18 boosted the CD4 T cells in our model. The initiation of the IL-18 response was shown to involve cells from the recipient host mice, but not the transferred Thy1.1 SM1 CD4 T cells. Thus, IL-18R+/+ SM1 CD4 T cells were not boosted by IL-18 after transfer into IL-18R−/− hosts (Fig. 3⇑). These data show that the initiation of the response requires IL-18R on cells other than the SM1 but does not speak to the possibility that IL-18 may work on the specific T cells later in the response. Because IL-18 did not act directly on the Ag-specific T cells to initiate the response, we studied which cells directly responded. IL-18 injection has been shown to rapidly stimulate NK cells to produce IFN-γ (10). NK-derived IFN-γ induces changes in circulating leukocyte levels in mice (59) and is crucial for directing Th1-mediated autoimmunity (60). However, NK depletion had no effect on the ability of SM1 cells to clonally expand or secrete IFN-γ in response to IL-18 (Fig. 2⇑). To extend this data, we demonstrated that IL-12 was not required for the IL-18-initiated responses. We also tested whether the p35−/− and p40−/− (IL-12−/−) recipients conditioned the SM1 response toward the Th2 direction but found that the WT mice induced as much IL-4 as the IL-12−/− mice. Ultimately, we demonstrated that host-derived IFN-γ was required for IFN-γ commitment, but not for expansion (Fig. 5⇑). Perhaps IFN-γ commitment is mediated by IFN-γ-producing DCs (61, 62, 63) or other cells of the immune system. Thus, IL-18 can condition peptide-specific Th effectors for IFN-γ and IL-4 production. Because B cells and macrophages have limited access to naive T cells in vivo, we focused our attention on DCs as they are the premier APC (64). Numerous studies have shown that DCs respond to IL-18 by inducing CD80, CD86, CD40, CD54, and MHC class II, and even by synthesizing IFN-γ (11, 25, 65, 66). We confirmed induction of all of these surface molecules on DCs in response to IL-18 (Fig. 8⇑, and data not shown), but also detected a significant increase of OX40L on DCs after in vivo IL-18 administration (Fig. 6⇑). Although IL-18 induces other costimulators, we demonstrated that CD134 signaling was central to the IL-18 effects on T cells. Enforced costimulation through CD134 restored the defective SM1 response in IL-18R−/− hosts (Fig. 6⇑). Furthermore, CD134 blockade significantly inhibited clonal expansion and dispersion of effector cells into peripheral tissues (Fig. 7⇑a). The reason for inhibition is unclear, but CD134 costimulation is known to deliver a survival and proliferative signal to T cells (67, 68, 69, 70), especially in combination with proinflammatory cytokines (50). Another possibility is that CD134 blockade inhibits T cell migration. CD134 signaling impacts autoreactive T cell homing to the CNS (71, 72) and gut (73), trafficking to B cell follicles (74), and induction of CXCR5 (75, 76). Thus, it is possible that IL-18 directs migration of T cells via CD134 signaling. Nevertheless, it is possible that output (or expansion) of specific T cells was inhibited, which thereby limited accumulation in peripheral tissues. Perhaps the most surprising result was the profound inhibition of IFN-γ producing effector Thy1.1 SM1 CD4 T cells after CD134 blockade (Fig. 7⇑b). Specifically, the number of total IFN-γ producers was reduced, while the superproducer population was almost abolished, even though CD40 (data not shown), CD80, and CD86 expression was not inhibited during CD134 blockade (Fig. 8⇑). 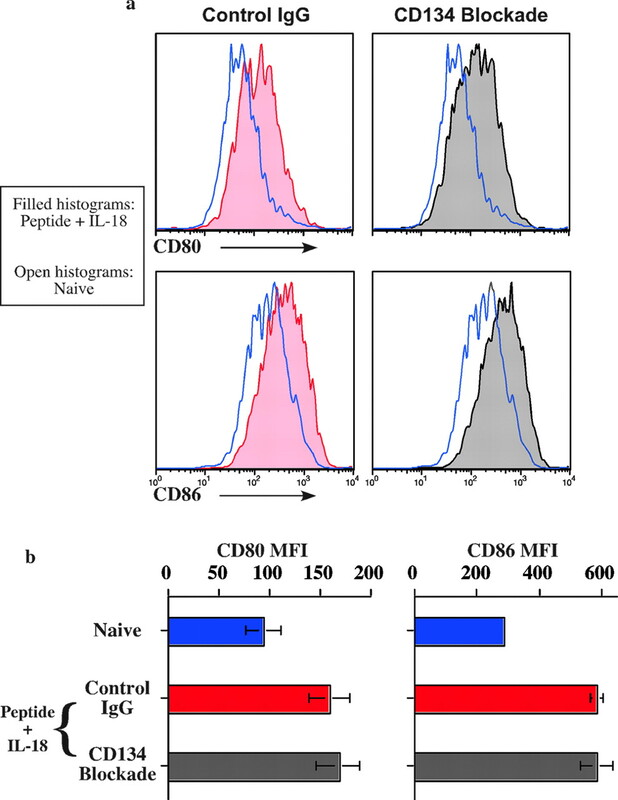 This demonstrates that IL-18 boosts expansion of IFN-γ-producing T cells via CD134, and perhaps CD80 and CD86 contribute to expansion of peptide-stimulated naive T cells. Also, these data extend the known role for CD134 and IL-18 in supporting Th2 responses (20, 77). Because high levels of IFN-γ were detected with IL-18 through the CD134 pathway, it may be possible to influence the balance of Th1 or Th2 differentiation. Ultimately, the expansion afforded by IL-18 through CD134 on either the Th1 or Th2 cells would dramatically increase potential responsiveness to a pathogen or to self. Therapeutically, this suggests that under inflammatory conditions which contain IL-18, inhibition of CD134 signaling may help to reduce the number of autoreactive cells, and there is substantial evidence that CD134 plays an important role in the generation and maintenance of autoimmunity (78). IL-18 has a relatively long half-life (∼18 h) in vivo (59), and thus one or two injections may be a reasonable and practical therapeutic means of inducing rapid immune responses in the short-term, without contributing to memory or pathogenic sequelae. However, this potent immune boost also serves to underscore how harmful persistent IL-18 can be in autoimmune and inflammatory conditions. IL-18 injection can exacerbate diabetes (79), joint destruction (80), and intestinal inflammation (81) and can promote myocardial dysfunction (82). Thus, IL-18 may be useful as a T cell adjuvant, but its risks and safety must be carefully considered. ↵1 This work was supported by National Institutes of Health Grants RO1-AI42858, RO1-AI52108, PO1-AI56172 Project 3 (to A.T.V.) and RO1-CA102577 (to A.D.W.). ↵2 Current address: Department of Inflammation, Amgen, 1201 Amgen Court West, Seattle WA 98119. ↵4 Abbreviations used in this paper: DC, dendritic cell; PLN, peripheral lymph node; MLN, mesenteric LN; CTM, complete tumor medium; WT, wild type. Matsui, K., T. Yoshimoto, H. Tsutsui, Y. Hyodo, N. Hayashi, K. Hiroishi, N. Kawada, H. Okamura, K. Nakanishi, K. Higashino. 1997. Propionibacterium acnes treatment diminishes CD4+NK1.1+ T cells but induces type I T cells in the liver by induction of IL-12 and IL-18 production from Kupffer cells. J. Immunol. 159: 97-106. Stoll, S., H. Jonuleit, E. Schmitt, G. Muller, H. Yamauchi, M. Kurimoto, J. Knop, A. H. Enk. 1998. Production of functional IL-18 by different subtypes of murine and human dendritic cells (DC): DC-derived IL-18 enhances IL-12-dependent Th1 development. Eur. J. Immunol. 28: 3231-3329. Akira, S.. 2000. The role of IL-18 in innate immunity. Curr. Opin. Immunol. 12: 59-63. Nakanishi, K., T. Yoshimoto, H. Tsutsui, H. Okamura. 2001. Interleukin-18 regulates both Th1 and Th2 responses. Annu. Rev. Immunol. 19: 423-474. Gracie, J. A., S. E. Robertson, I. B. McInnes. 2003. Interleukin-18. J. Leukocyte Biol. 73: 213-224. Suzuki, N., N. J. Chen, D. G. Millar, S. Suzuki, T. Horacek, H. Hara, D. Bouchard, K. Nakanishi, J. M. Penninger, P. S. Ohashi, W. C. Yeh. 2003. IL-1 receptor-associated kinase 4 is essential for IL-18-mediated NK and Th1 cell responses. J. Immunol. 170: 4031-4035. Tsuji-Takayama, K., Y. Aizawa, I. Okamoto, H. Kojima, K. Koide, M. Takeuchi, H. Ikegami, T. Ohta, M. Kurimoto. 1999. Interleukin-18 induces interferon-γ production through NF-κB and NFAT activation in murine T helper type 1 cells. Cell Immunol. 196: 41-50. Okamura, H., K. Nagata, T. Komatsu, T. Tanimoto, Y. Nukata, F. Tanabe, K. Akita, K. Torigoe, T. Okura, S. Fukuda, et al 1995. A novel costimulatory factor for γ interferon induction found in the livers of mice causes endotoxic shock. Infect. Immun. 63: 3966-3972. Tomura, M., X. Y. Zhou, S. Maruo, H. J. Ahn, T. Hamaoka, H. Okamura, K. Nakanishi, T. Tanimoto, M. Kurimoto, H. Fujiwara. 1998. A critical role for IL-18 in the proliferation and activation of NK1.1+CD3− cells. J. Immunol. 160: 4738-4746. Stober, D., R. Schirmbeck, J. Reimann. 2001. IL-12/IL-18-dependent IFN-γ release by murine dendritic cells. J. Immunol. 167: 957-965. Munder, M., M. Mallo, K. Eichmann, M. Modolell. 1998. Murine macrophages secrete interferon γ upon combined stimulation with interleukin (IL)-12 and IL-18: A novel pathway of autocrine macrophage activation. J. Exp. Med. 187: 2103-2108. Lathrop, S. K., C. A. Huddleston, P. A. Dullforce, M. J. Montfort, A. D. Weinberg, D. C. Parker. 2004. A signal through OX40 (CD134) allows anergic, autoreactive T cells to acquire effector cell functions. J. Immunol. 172: 6735-6743. Raue, H. P., J. D. Brien, E. Hammarlund, M. K. Slifka. 2004. Activation of virus-specific CD8+ T cells by lipopolysaccharide-induced IL-12 and IL-18. J. Immunol. 173: 6873-6881. Beadling, C., M. K. Slifka. 2005. Differential regulation of virus-specific T-cell effector functions following activation by peptide or innate cytokines. Blood 105: 1179-1186. Takeda, K., H. Tsutsui, T. Yoshimoto, O. Adachi, N. Yoshida, T. Kishimoto, H. Okamura, K. Nakanishi, S. Akira. 1998. Defective NK cell activity and Th1 response in IL-18-deficient mice. Immunity 8: 383-390. Yoshimoto, T., H. Mizutani, H. Tsutsui, N. Noben-Trauth, K. Yamanaka, M. Tanaka, S. Izumi, H. Okamura, W. E. Paul, K. Nakanishi. 2000. IL-18 induction of IgE: dependence on CD4+ T cells, IL-4 and STAT6. Nat. Immunol. 1: 132-137. Puren, A. J., G. Fantuzzi, Y. Gu, M. S. Su, C. A. Dinarello. 1998. Interleukin-18 (IFNγ-inducing factor) induces IL-8 and IL-1β via TNFα production from non-CD14+ human blood mononuclear cells. J. Clin. Invest. 101: 711-721. Hoshino, T., R. H. Wiltrout, H. A. Young. 1999. IL-18 is a potent coinducer of IL-13 in NK and T cells: a new potential role for IL-18 in modulating the immune response. J. Immunol. 162: 5070-5507. Netea, M. G., G. Fantuzzi, B. J. Kullberg, R. J. Stuyt, E. J. Pulido, R. C. McIntyre, Jr, L. A. Joosten, J. W. Van der Meer, C. A. Dinarello. 2000. Neutralization of IL-18 reduces neutrophil tissue accumulation and protects mice against lethal Escherichia coli and Salmonella typhimurium endotoxemia. J. Immunol. 164: 2644-2649. Banda, N. K., A. Vondracek, D. Kraus, C. A. Dinarello, S. H. Kim, A. Bendele, G. Senaldi, W. P. Arend. 2003. Mechanisms of inhibition of collagen-induced arthritis by murine IL-18 binding protein. J. Immunol. 170: 2100-2105. Wirtz, S., C. Becker, R. Blumberg, P. R. Galle, M. F. Neurath. 2002. Treatment of T cell-dependent experimental colitis in SCID mice by local administration of an adenovirus expressing IL-18 antisense mRNA. J. Immunol. 168: 411-420. Dinarello, C. A., G. Fantuzzi. 2003. Interleukin-18 and host defense against infection. J. Infect. Dis. 187: (Suppl. 2):S370-S384. Eaton, A. D., D. Xu, P. Garside. 2003. Administration of exogenous interleukin-18 and interleukin-12 prevents the induction of oral tolerance. Immunology 108: 196-203. Ahn, H. J., S. Maruo, M. Tomura, J. Mu, T. Hamaoka, K. Nakanishi, S. Clark, M. Kurimoto, H. Okamura, H. Fujiwara. 1997. A mechanism underlying synergy between IL-12 and IFN-γ-inducing factor in enhanced production of IFN-γ. J. Immunol. 159: 2125-2131. Yoshimoto, T., K. Takeda, T. Tanaka, K. Ohkusu, S. Kashiwamura, H. Okamura, S. Akira, K. Nakanishi. 1998. 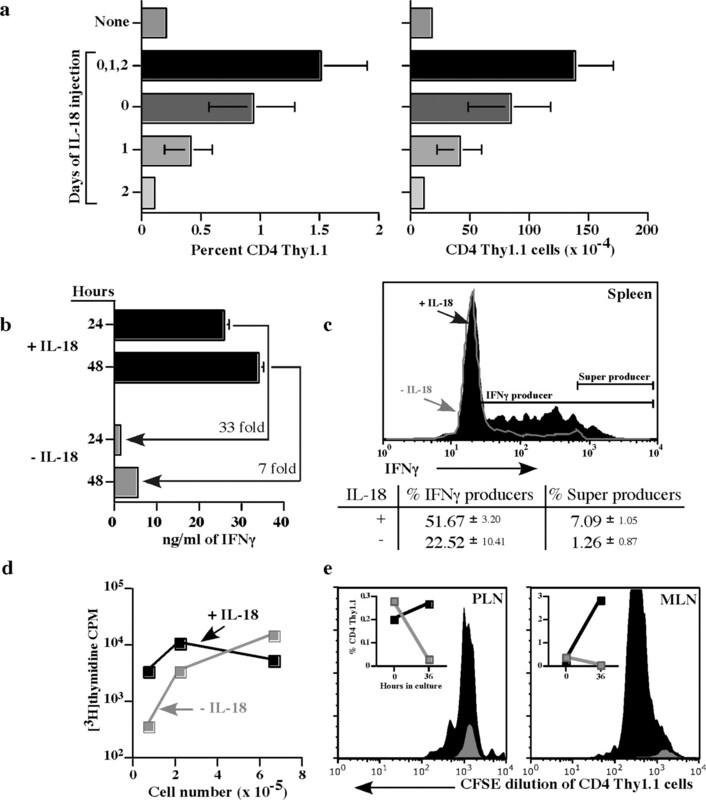 IL-12 up-regulates IL-18 receptor expression on T cells, Th1 cells, and B cells: synergism with IL-18 for IFN-γ production. J. Immunol. 161: 3400-3407. Komai-Koma, M., J. A. Gracie, X. Q. Wei, D. Xu, N. Thomson, I. B. McInnes, F. Y. Liew. 2003. Chemoattraction of human T cells by IL-18. J. Immunol. 170: 1084-1090. Berg, R. E., E. Crossley, S. Murray, J. Forman. 2003. Memory CD8+ T cells provide innate immune protection against Listeria monocytogenes in the absence of cognate antigen. J. Exp. Med. 198: 1583-1593. Neighbors, M., X. Xu, F. J. Barrat, S. R. Ruuls, T. Churakova, R. Debets, J. F. Bazan, R. A. Kastelein, J. S. Abrams, A. O’Garra. 2001. A critical role for interleukin 18 in primary and memory effector responses to Listeria monocytogenes that extends beyond its effects on interferon-γ production. J. Exp. Med. 194: 343-354. Mastroeni, P., S. Clare, S. Khan, J. A. Harrison, C. E. Hormaeche, H. Okamura, M. Kurimoto, G. Dougan. 1999. Interleukin 18 contributes to host resistance and γ interferon production in mice infected with virulent Salmonella typhimurium. Infect. Immun. 67: 478-483. Sansonetti, P. J., A. Phalipon, J. Arondel, K. Thirumalai, S. Banerjee, S. Akira, K. Takeda, A. Zychlinsky. 2000. Caspase-1 activation of IL-1β and IL-18 are essential for Shigella flexneri-induced inflammation. Immunity 12: 581-590. Choi, H. J., C. A. Dinarello, L. Shapiro. 2001. Interleukin-18 inhibits human immunodeficiency virus type 1 production in peripheral blood mononuclear cells. J. Infect. Dis. 184: 560-568. Fujioka, N., R. Akazawa, K. Ohashi, M. Fujii, M. Ikeda, M. Kurimoto. 1999. Interleukin-18 protects mice against acute herpes simplex virus type 1 infection. J. Virol. 73: 2401-2409. Zhu, M., X. Xu, H. Liu, X. Liu, S. Wang, F. Dong, B. Yang, G. Song. 2003. Enhancement of DNA vaccine potency against herpes simplex virus 1 by coadministration of an interleukin-18 expression plasmid as a genetic adjuvant. J. Med. Microbiol. 52: 223-228. Xia, D., S. Zheng, W. Zhang, L. He, Q. Wang, J. Pan, L. Zhang, J. Wang, X. Cao. 2003. Effective induction of therapeutic antitumor immunity by dendritic cells coexpressing interleukin-18 and tumor antigen. J. Mol. Med. 81: 585-596. Hwang, K. S., W. K. Cho, J. Yoo, Y. R. Seong, B. K. Kim, S. Kim, D. S. Im. 2004. Adenovirus-mediated interleukin-18 mutant in vivo gene transfer inhibits tumor growth through the induction of T cell immunity and activation of natural killer cell cytotoxicity. Cancer Gene Ther. 11: 397-407. Chung, S. W., E. P. Cohen, T. S. Kim. 2004. Generation of tumor-specific cytotoxic T lymphocyte and prolongation of the survival of tumor-bearing mice using interleukin-18-secreting fibroblasts loaded with an epitope peptide. Vaccine 22: 2547-2557. Luo, Y., H. Zhou, M. Mizutani, N. Mizutani, C. Liu, R. Xiang, R. A. Reisfeld. 2005. A DNA vaccine targeting Fos-related antigen 1 enhanced by IL-18 induces long-lived T-cell memory against tumor recurrence. Cancer Res. 65: 3419-3427. McSorley, S. J., B. T. Cookson, M. K. Jenkins. 2000. 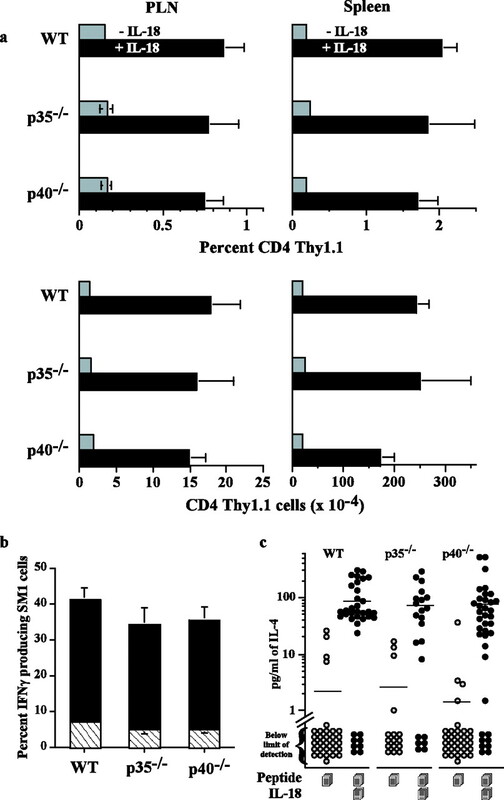 Characterization of CD4+ T cell responses during natural infection with Salmonella typhimurium. J. Immunol. 164: 986-993.
al-Shamkhani, A., M. L. Birkeland, M. Puklavec, M. H. Brown, W. James, A. N. Barclay. 1996. OX40 is differentially expressed on activated rat and mouse T cells and is the sole receptor for the OX40 ligand. Eur. J. Immunol. 26: 1695-1169. Akiba, H., H. Oshima, K. Takeda, M. Atsuta, H. Nakano, A. Nakajima, C. Nohara, H. Yagita, K. Okumura. 1999. CD28-independent costimulation of T cells by OX40 ligand and CD70 on activated B cells. J. Immunol. 162: 7058-7066. Masopust, D., V. Vezys, A. L. Marzo, L. Lefrancois. 2001. Preferential localization of effector memory cells in nonlymphoid tissue. Science 291: 2413-2247. Swiggard, W. J., R. M. Nonacs, M. D. Witmer-Pack, R. M. Steinman, K. Inaba. 1991. Enrichment of dendritic cells by plastic adherence and EA rosetting. J. E. Coligan, Jr, and A. M. Kruisbeek, Jr, and D. H. Marguiles, Jr, and E. M. Shevach, Jr, and W/ Strober, Jr, eds. Current Protocols in Immunology Wiley, New York. Koo, G. C., J. R. Peppard. 1984. Establishment of monoclonal anti-Nk-1.1 antibody. Hybridoma 3: 301-303. Son, Y. I., R. M. Dallal, R. B. Mailliard, S. Egawa, Z. L. Jonak, M. T. Lotze. 2001. Interleukin-18 (IL-18) synergizes with IL-2 to enhance cytotoxicity, interferon-γ production, and expansion of natural killer cells. Cancer Res. 61: 884-888. Maxwell, J. R., A. Weinberg, R. A. Prell, A. T. Vella. 2000. Danger and OX40 receptor signaling synergize to enhance memory T cell survival by inhibiting peripheral deletion. J. Immunol. 164: 107-112. Salek-Ardakani, S., J. Song, B. S. Halteman, A. G. Jember, H. Akiba, H. Yagita, M. Croft. 2003. OX40 (CD134) controls memory T helper 2 cells that drive lung inflammation. J. Exp. Med. 198: 315-324. Pakala, S. V., P. Bansal-Pakala, B. S. Halteman, M. Croft. 2004. Prevention of diabetes in NOD mice at a late stage by targeting OX40/OX40 ligand interactions. Eur. J. Immunol. 34: 3039-3046. Reinhardt, R. L., A. Khoruts, R. Merica, T. Zell, M. J. Jenkins. 2001. Visualizing the generation of memory CD4 T cells in the whole body. Nature 410: 101-105. Yamanaka, R., K. G. Xanthopoulos. 2005. Induction of antigen-specific immune responses against malignant brain tumors by intramuscular injection of sindbis DNA encoding gp100 and IL-18. DNA Cell Biol. 24: 317-324. Lee, S., M. Gierynska, S. K. Eo, N. Kuklin, B. T. Rouse. 2003. Influence of DNA encoding cytokines on systemic and mucosal immunity following genetic vaccination against herpes simplex virus. Microbes. Infect. 5: 571-578. Stuyt, R. J., M. G. Netea, J. H. van Krieken, J. W. van der Meer, B. J. Kullberg. 2004. Recombinant interleukin-18 protects against disseminated Candida albicans infection in mice. J. Infect. Dis. 189: 1524-1157. Tanaka-Kataoka, M., T. Kunikata, S. Takayama, K. Iwaki, K. Ohashi, M. Ikeda, M. Kurimoto. 1999. In vivo antiviral effect of interleukin 18 in a mouse model of vaccinia virus infection. Cytokine 11: 593-599. Yu, J. J., C. S. Tripp, J. H. Russell. 2003. Regulation and phenotype of an innate Th1 cell: role of cytokines and the p38 kinase pathway. J. Immunol. 171: 6112-6118. Hosohara, K., H. Ueda, S. Kashiwamura, T. Yano, T. Ogura, S. Marukawa, H. Okamura. 2002. Interleukin-18 induces acute biphasic reduction in the levels of circulating leukocytes in mice. Clin. Diagn. Lab. Immunol. 9: 777-783. Shi, F. D., K. Takeda, S. Akira, N. Sarvetnick, H. G. Ljunggren. 2000. IL-18 directs autoreactive T cells and promotes autodestruction in the central nervous system via induction of IFN-γ by NK cells. J. Immunol. 165: 3099-3104. Mullen, A. C., F. A. High, A. S. Hutchins, H. W. Lee, A. V. Villarino, D. M. Livingston, A. L. Kung, N. Cereb, T. P. Yao, S. Y. Yang, S. L. Reiner. 2001. Role of T-bet in commitment of TH1 cells before IL-12-dependent selection. Science 292: 1907-1910. Lugo-Villarino, G., R. Maldonado-Lopez, R. Possemato, C. Penaranda, L. H. Glimcher. 2003. T-bet is required for optimal production of IFN-γ and antigen-specific T cell activation by dendritic cells. Proc. Natl. Acad. Sci. USA 100: 7749-7754. Gutzmer, R., K. Langer, S. Mommert, M. Wittmann, A. Kapp, and T. Werfel, T. 2003. Human dendritic cells express the IL-18R and are chemoattracted to IL-18. J. Immunol. 171: 6363–6371. Li, J., M. L. Mbow, L. Sun, L. Li, G. Yang, D. E. Griswold, A. Schantz, D. J. Shealy, T. J. Goletz, J. Wan, D. Peritt. 2004. Induction of dendritic cell maturation by IL-18. Cell Immunol. 227: 103-108. Weatherill, A. R., J. R. Maxwell, C. Takahashi, A. D. Weinberg, A. T. Vella. 2001. Ox40 ligation enhances cell cycle turnover of ag-activated cd4 t cells in vivo. Cell Immunol. 209: 63-75. Weinberg, A. D., D. E. Evans, C. Thalhofer, T. Shi, R. A. Prell. 2004. The generation of T cell memory: a review describing the molecular and cellular events following OX40 (CD134) engagement. J. Leukocyte Biol. 75: 962-972. Song, J., T. So, M. Cheng, X. Tang, M. Croft. 2005. Sustained survivin expression from OX40 costimulatory signals drives T cell clonal expansion. Immunity 22: 621-631. Nohara, C., H. Akiba, A. Nakajima, A. Inoue, C. S. Koh, H. Ohshima, H. Yagita, Y. Mizuno, K. Okumura. 2001. Amelioration of experimental autoimmune encephalomyelitis with anti-OX40 ligand monoclonal antibody: a critical role for OX40 ligand in migration, but not development, of pathogenic T cells. J. Immunol. 166: 2108-2115. Totsuka, T., T. Kanai, K. Uraushihara, R. Iiyama, M. Yamazaki, H. Akiba, H. Yagita, K. Okumura, M. Watanabe. 2003. Therapeutic effect of anti-OX40L and anti-TNF-α MAbs in a murine model of chronic colitis. Am. J. Physiol. 284: G595-G603. Brocker, T., A. Gulbranson-Judge, S. Flynn, M. Riedinger, C. Raykundalia, P. Lane. 1999. CD4 T cell traffic control: in vivo evidence that ligation of OX40 on CD4 T cells by OX40-ligand expressed on dendritic cells leads to the accumulation of CD4 T cells in B follicles. Eur. J. Immunol. 29: 1610-1616. Walker, L. S., A. Gulbranson-Judge, S. Flynn, T. Brocker, C. Raykundalia, M. Goodall, R. Forster, M. Lipp, P. Lane. 1999. Compromised OX40 function in CD28-deficient mice is linked with failure to develop CXC chemokine receptor 5-positive CD4 cells and germinal centers. J. Exp. Med. 190: 1115-1122. Obermeier, F., H. Schwarz, N. Dunger, U. G. Strauch, N. Grunwald, J. Scholmerich, W. Falk. 2003. OX40/OX40L interaction induces the expression of CXCR5 and contributes to chronic colitis induced by dextran sulfate sodium in mice. Eur. J. Immunol. 33: 3265-3274. Flynn, S., K. M. Toellner, C. Raykundalia, M. Goodall, P. Lane. 1998. CD4 T cell cytokine differentiation: the B cell activation molecule, OX40 ligand, instructs CD4 T cells to express interleukin 4 and upregulates expression of the chemokine receptor, Blr-1. J. Exp. Med. 188: 297-304. Oikawa, Y., A. Shimada, A. Kasuga, J. Morimoto, T. Osaki, H. Tahara, T. Miyazaki, F. Tashiro, E. Yamato, J. Miyazaki, T. Saruta. 2003. Systemic administration of IL-18 promotes diabetes development in young nonobese diabetic mice. J. Immunol. 171: 5865-5875. Joosten, L. A., R. L. Smeets, M. I. Koenders, L. A. van den Bersselaar, M. M. Helsen, B. Oppers-Walgreen, E. Lubberts, Y. Iwakura, F. A. van de Loo, W. B. van den Berg. 2004. Interleukin-18 promotes joint inflammation and induces interleukin-1-driven cartilage destruction. Am. J. Pathol. 165: 959-967. Chikano, S., K. Sawada, T. Shimoyama, S. I. Kashiwamura, A. Sugihara, K. Sekikawa, N. Terada, K. Nakanishi, H. Okamura. 2000. IL-18 and IL-12 induce intestinal inflammation and fatty liver in mice in an IFN-γ dependent manner. Gut 47: 779-786. Woldbaek, P. R., J. B. Sande, T. A. Stromme, P. K. Lunde, S. Djurovic, T. Lyberg, G. Christensen, T. Tonnessen. 2005. Daily administration of interleukin-18 causes myocardial dysfunction in healthy mice. Am. J. Physiol. 289: H708-H714.